17'' Large Christmas Stockings Set of 3 with Santa, Reindeer, Snowman, Gospire Classic Linen Christmas Socks for Decorations Gift/Treat Bags by Gospire at Two Clock. Hurry! Limited time offer. Offer valid only while supplies last. Brand New Design, Made of Durable Linen. 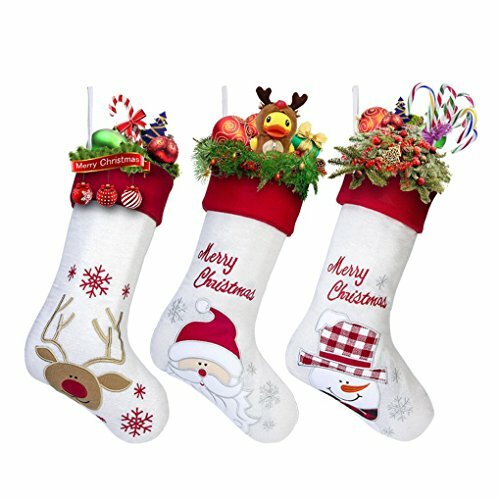 Set of 3 Stockings Featuring with Lovely Santa, Snowman and Reindeer Patterns. 17" Tall. Larger and Longer Than Normal Size, Plenty of Gifts Can be Packed Into it. Suitable for Christmas Decoration (With Lanyard) and Gift Bags. If you have any questions about this product by Gospire, contact us by completing and submitting the form below. If you are looking for a specif part number, please include it with your message.